There’s a fun multilingual pun referring back to the last post. We had some good suggestions for “ice cream”—too many, in fact. I think there’s only one thing to be done: We need to start up several different Dothraki ice cream chains, each one using a different word for “ice cream”. One year later, we’ll see which word has caught on, and that will be our word for “ice cream”. As it is, though, I liked Qvaak’s suggestion of jeshokh lamekhi. As I see it, a jeshokh could be a word for any frozen treat, with jeshokh lamekhi being ice cream specifically. Good suggestions all! Makes me want to eat ice cream (though, of course, most things do. Mmmmm… Ice cream…). Those who follow me on Twitter probably will have already seen some of what I’m about to share, but if you don’t, I wanted to spotlight a couple of cool things that have found their way onto the internet recently. Oh, man, and I just saw a couple new ones over on Tumblr—check it out! Now, in the case of all the above, I didn’t actually come up with the phrases (i.e. 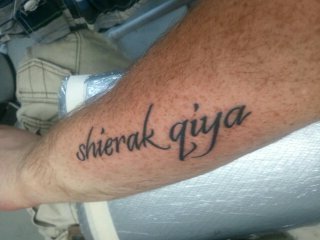 I didn’t invent the phrase “my sun and stars”), but I did invent most of the words (George R. R. Martin gets credit for shierak and qiya). Having the language spoken on Game of Thrones has been pretty cool. But to think that someone actually tattooed those words onto their body… Wow. That, to me, is beyond incredible. 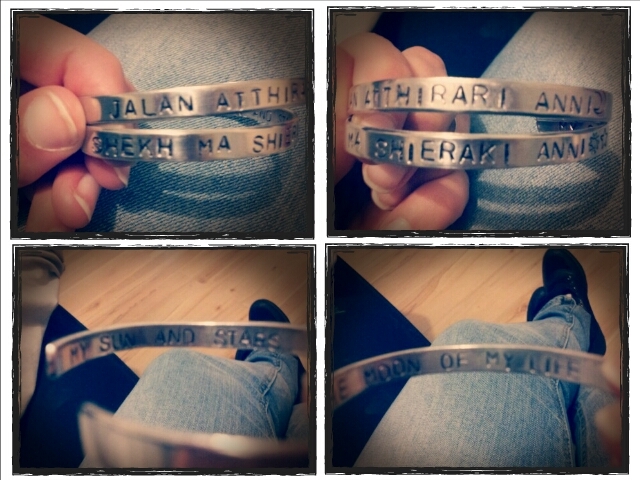 It means a lot to know that someone would actually like the phrases in Dothraki enough to have them become an indelible part of their own body (after all, they very well could have gone with the English as is written in the books). You guys are awesome! If I ever get a chance to meet you in person, I’m going to buy you an ice cream (or a non-dairy equivalent, if you prefer). If you happen to spot anything cool with some Dothraki on it somewhere out on the internet, let me know and I’ll throw it up here. The fan art inspired by Game of Thrones has been awesome to see. Update: Oh, duh. Right after I sent this I thought, “Oh, I should have included the word for ‘tattoo’ in Dothraki.” My head isn’t with me at present. Tattoos are about as old as humans are, so I figured the Dothraki needed a word for it (though they also need a word for whatever kind of body art is used in the show. Those aren’tattoos, but what are they, exactly? Racing stripes?). The root for the various tattoo words is lir, with the word lir (inanimate noun) being the word for “tattoo”. To give someone a tattoo, you use the verb lirat (e.g. “He put a tattoo on me” would be Me lir anna). The image or symbol depicted in a tattoo is the lirikh; the one who gives a tattoo is the lirak; and all of one’s tattoos taken together is one’s lirisir (think of it like a “body of work” [pun intended if you thought it was funny]). So, there you go! 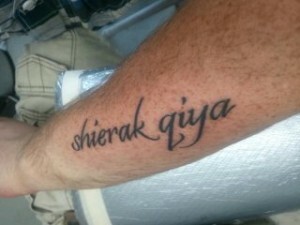 Now you can talk about your Dothraki tattoos in Dothraki. Fonas chek! Posted on August 7, 2012, in Community, Vocabulary and tagged lol, misc, modern terminology, translation. Bookmark the permalink. 6 Comments. So what word would you get tattooed if you were to get one? And come to think of it, in what language? On that topic…have you ever thought of creating some small obscure word that just happens to be the same in all your current professional languages? Most definitely something from Kamakawi. Perhaps kala, but I’d have to see. A list of my top ten glyphs is here. Heh, heh… Languages’ phonologies differ so radically that a full word often doesn’t work from language to language, but there are one or two things I add to each one (more on the root level). Searching for them would be a fun afternoon for someone some day. Kala is the Okuna word for “leg”, so if you got it tattooed on your leg, you’d win the award for Most Obscure Cross-Conlang Pun Ever. I’m terrible at Photoshop, but if someone’s good with it, I will provide you with a picture of my leg to make this happen. 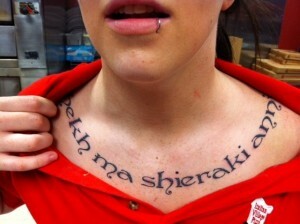 ‘Hrakkar’ would certainly be a good word to be tattooed on me. Or the nickname based on my teal name Tim– ‘Timba’. It really is great to see people with Dothraki tattoos. Lets hope it keeps up, as it shows growing interest. So you think Dothraki tattoos are crazy? At the recent Avatar fans convention I attended, there were at least three people there who were working on full body Na’vi blue (ta’lengean in their language) tattos! You can find some pictures of them at the Avatarmeet.com website. So considering peoples’ creativity– and their willingness to permanently mark up their bodies– I expect we haven’t seen the end of Dothraki body art! DoliM'ath, I'm interested in learning too! 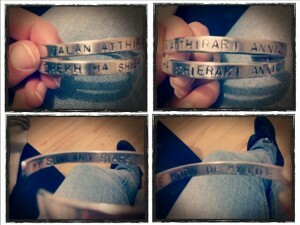 Dothraki language and Game of Thrones copyright © HBO. The HBO show Game of Thrones and the Dothraki language were inspired by George R. R. Martin's A Song of Ice and Fire. WordPress theme based on Mystique by digitalnature.